How data that is relevant, timely, personal and actionable can change behaviour. A burger sits before you, and a decision. To eat or not to eat. Would access to data cause a behavioural change? What if you could see the impact of eating the burger before you ate it. Your risk of heart attack goes up .3%. Your weight will go up .1lbs by next Tuesday. And your LDL cholesterol will enter a warning range. Why might that data make you think twice. If it was personal to you and not some average of a bunch of people. The impact is compounded as you ate a pizza yesterday and a carbonara the day before. You receive the information in a timely manner, at the point of eating the burger, not 3 weeks afterwards. The information is relevant to what you are doing, i.e. it is health and diet information. And, finally, it is actionable. Will I eat it, yes or no. The information allows for a change in behaviour. 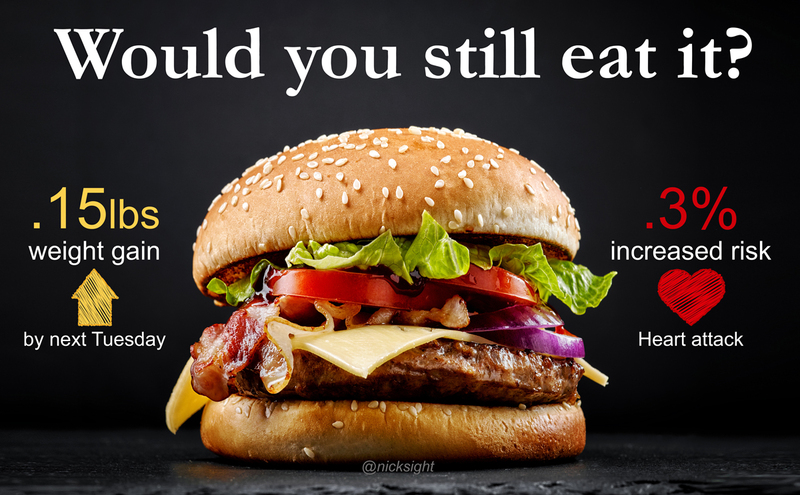 Maybe you will look at burgers differently now, but hopefully you will see how data can help you act differently and, hence induce a behavioural change. In the next article we will explore how this becomes manifest in an enterprise-grade dashboard and why a dilligent design process leads to increased profits. Would you like any of these images for your slides for presentations at work? Subscribe to the site as I send out free content that helps you win over colleagues to the power of acting on data. 1 responses on "The Insight Burger - A Primer on Behavioural Change with Data"